Size: 18.5 x 20 inches. 'Map of the British Empire in America with the French Spanish and Dutch Settlements adjacent thereto by Henry Popple. a London Grave par Jean Conr Back 1756'. Johann Conrad Back Map. This Map is that 1756 Map by Johnann Conrad Back (Jean Conr Back) known as BACK KEY STATE 2 1756. It is a Re-engraved BACK KEY STATE 1 plate with a number of important additions and revisions (but no corrections to spelling errors). This is the only Key Map which has significant geographical modifications compared to Popple's British original. An engraved date "1756." is squeezed at bottom of title in cartouche. "Hohio" River is now extended to Pennsylvania and a number of new forts shown along the river. At the heads of the Ohio River an annotation appears - "Surces de l'Oyo". Lake Ontario is named "LAKE ONTARIO OF [sic] FRONTENAC". At the "Heads of the Mississipi " Indian tribes of "Western Issaties" and "Eastern Issaties" are now named. Names like "Assinais", "Cadodaguios" are added in Texas, "S. Diego la Conception" in New Mexico, "St. Paulo" in Florida. These new place-names, not on BACK KEY STATE 1, are present on Popple's large 20-Sheet map (and C&M 4-Sheet map) but not on his Key Map ("la Conception" and "St. Diego" are marked as two separate towns on Popple's large map). "N. Orleans" appears in Louisiana. A number of new place-names are shown in the Great Lakes area and between the Great Lakes and Hudson Bay. An island named "Ganeonskaon" is placed in the north-east part of Lake Erie. 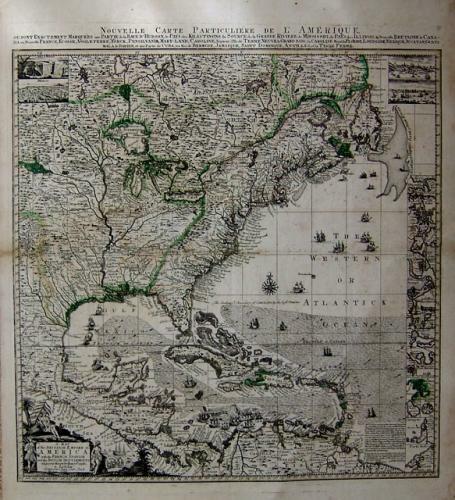 Foreign copies of the Key Map were created from 1741 to 1782. A Dutch copy of the Key Map was created by Covens and Mortier c. 1741, and in c.1755-1756 the German Johnann Conrad Back created a very close copy of the Dutch key map. 'NOUVELLE CARTE PARTICULIÉRE DE L'AMÉRIQUE OU SONT EXACTEMENT MARQUÉES une PARTIE de la BAYE D'HUDSON, le PAYS des KILISTINONS la SOURCE de la GRANDE RIVIERE de MISSISSIPI [sic], le PAYS des ILLINOIS, la Nouvelle BRETAGNE le CANADA ou Nouvelle FRANCE, ECOSSE, ANGLETERRE, YORCK [sic], PENSILVANIE, MARY-LAND, CAROLINE, Septent: l'Ile de TERRE NEUVE, le GRAND BANC la CAROLINE Merid. la FLORIDE, LOUISIANE, MEXIQUE, JUCATAN, GUATIMALA, le DARIEN, et une Partie de CUBA, les Iles de BERMUDE, JAMAIQUE, SAINT DOMINQUE, ANTILLES, et la TERRE FERMÉ'. The map has green highlighting along the mountains, rivers and the Great Lakes. The condition is very good with a strong imprint on quality paper. The center fold has several repaired small holes and a small area of minor toning. Background: Henry Popple's 1733 map is one of the two most important large-scale colonial maps of North America. The map was comprised of 20 sections and one key map. George Washington, who drew a number of maps himself, owned a copy of Popple's Key map. Benjamin Franklin ordered "two setts of Popple's Mapps of N. America one bound the other in Sheets" for the Pennsylvania Assembly in 1746. Popple's map is truly an important piece of Americana - a fundamental centerpiece of any serious collection of North American maps.